While art as a form of political dissent has existed for centuries, work centering around the escalating level of gun violence in America is a relatively recent phenomenon. For two local artists, who happen to be grandmothers, their foray into the world of art with a political message has taken them right up to the president’s sightline. 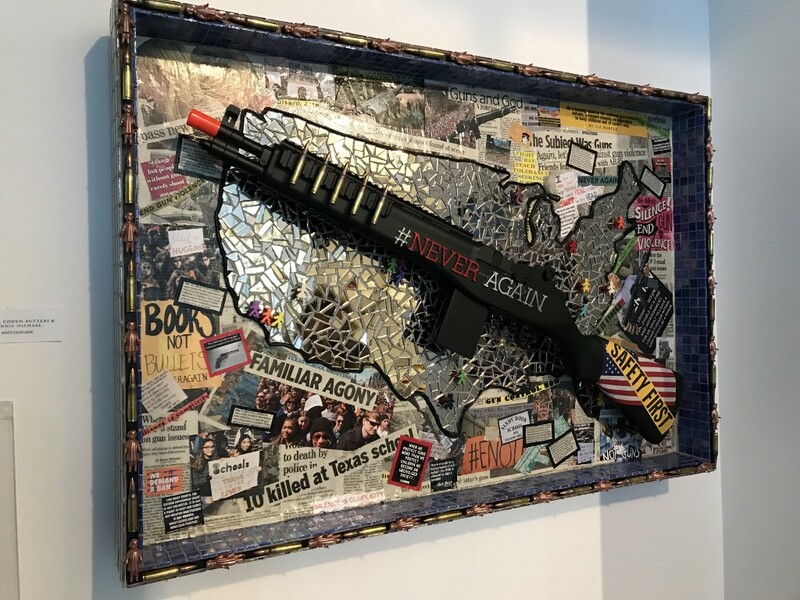 Friends Ronnie Michael of Cherry Hill and Merryl Cohen-Buttari of Voorhees have collaborated on a piece, entitled #NEVERAGAIN, which is on display at the Center for Contemporary Political Art at Mather Studios in Washington, D.C., situated a couple blocks east of the White House. 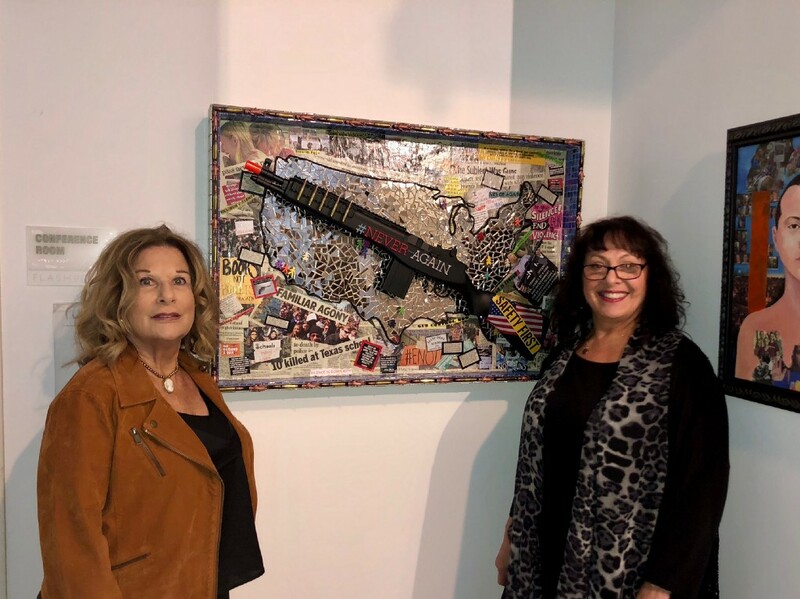 Constructed from mirror tiles, color tiles, newspaper print, bullets and topped off with a toy gun made to look like an M15 automatic rifle, the installation is intended to evoke a strong reaction in observers much like the one that led both women to create it. Michael and Cohen-Buttari found a kindred spirit in Charles Krause, founder and chair of the Center for Contemporary and Political Art, who served as a correspondent for multiple major news outlets. He was shot and wounded while on assignment with the Washington Post in 1978 while covering the Peoples Temple in Jonestown, Guyana. Michael grew up in North Jersey but attended Tyler School of Art, having been hooked on drawing and landscapes from a very early age thanks to excursions with her father. She specialized in illustration and graphic design in the pre-computer era, but had to quickly contemporize. About eight years ago, she started dabbling in mosaics. Cohen-Buttari ran an interior design business in the Cherry Hill area for roughly 25 years. She started weaving about 30 years ago, but switched in the last 15 years to crafting mosaics. The pair met at a meeting of mosaic artists outside Philadelphia, and became good friends out of Michael’s admiration for Cohen-Buttari’s work. Cohen-Buttari and Michael estimated their original work took more than 30 hours to complete, in three- to four-hour sessions per day, over three months. The pair has begun another collaborative piece, this time centering on the ideological battleground of legal and illegal immigration. Though unfinished, it has taken approximately as long as their currently displayed work. The joy of creating, they said, exists parallel to the sadness of loss. “When the children are out there saying ‘nobody’s helping,’ some people are helping,” Michael said. For more information on Cohen-Buttari’s work, contact her by phone at (609) 513–1512 or by email at merrylwb@comcast.net. For more information on Michael’s art, contact her at Ronniem1122@aol.com. “Defining the Art of Change in the Age of Trump” had been scheduled to show from Sept. 30 through Nov. 14, but has been extended through Nov. 25 due to its popularity.